Graduate Student Kat Cosburn has been selected for an American Geophysical Union Outstanding Student Paper Award, based on her poster at the Fall Meeting of the AGU. One way to predict volcanic eruptions would be to infer the motion of magma beneath the shallow portions of volcanoes. This motion of magma may be monitored by measuring the density of the volcano, and changes in its density through time. Gravity measurements at the Earth’s surface cannot uniquely determine the shallow density structure, and independent constraints to infer this density are needed. To provide these constraints, our research presents a novel approach using the attenuation of cosmic ray muons and, using Bayesian joint inversion techniques, we are able to obtain a prediction of the density structure at a well-characterized site near Los Alamos. 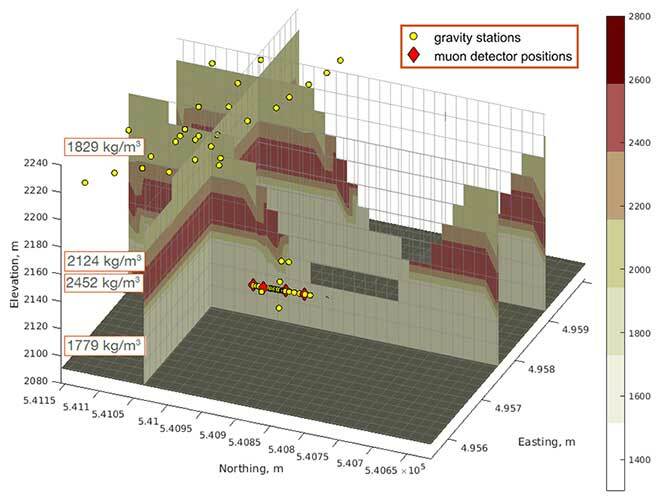 Following this test of the joint gravity and muon approach, we hope to apply this method to an active volcanic site. The Outstanding Student Paper Awards promote, recognize and reward undergraduate, Master's and PhD students for quality research in the Earth and space sciences. It is a great honor for young scientists at the beginning of their careers. The process relies entirely on volunteer judges. Typically the top 3-5% of presenters in each Section or Focus Group are awarded an OSPA and all judged students are provided feedback. Find out more about this award. Congratulations, Kat!